Tommy Cannon Studios: Fred the Mustard Packet is Spinning a Sign! Fred the Mustard Packet is Spinning a Sign! He will twirl a sign though. It's in the title for a reason. I'm enjoying the easy-to-use Webtoons platform. And, I am finding that Fred is a good way to get my stories out of me. I have a ton of crazy stories in notepads and in areas of my brain. I find that Fred plus Webtoons will be a great way to get those stories out. 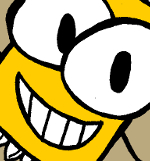 With the current schedule I should have a Fred the Mustard Packet graphic novel done every year, and maybe some years I'll have two completed. I enjoy treating it like a newspaper comic strip and a graphic novel. It pushes me to make each page funny enough to stand on its own and to make each page work as a part of a bigger story. Fun stuff. Thank you to those of you who subscribe, like and share the Fred pages. And, a giant HUGE thank you to all of my Patreon supporters. Every click of support truly does help Fred and all of the other Cannon projects move forward and upward.